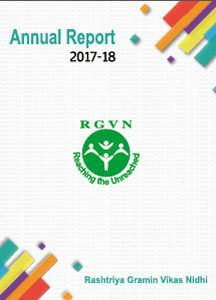 Institution Building RGVN builds grassroot institutions and offers support in the form of need assessment, capacity development and strategic business development of the organizations. It promotes, develops and nurtures Self Help Groups (SHGs), Federations and Cooperatives. RGVN carries Institutional Building activities with aid received from national and international funding agencies. Livelihood and Food Security RGVN introduces sustainable agricultural practices and ensures post-project sustenance. It builds the capacities of small and marginal farmers to adopt improved technological methods. It enables farmers to exploit mainstream markets and sustain economic gains. Vermicompost, productivity enhancement and the System of Rice Intensification (SRI) are RGVN’s major projects. Capacity Building RGVN’s capacity building activities comprise grassroot level institutions, SHGs, NGOs, Cooperatives and Famers’ Clubs. It involves in Institutional Development, Skill upgradation for Sectoral Interventions and Livelihood in Service Sectors. Organizational governance, leadership skills, financial literacy, book keeping and technological advancements are a part of the training. This is a compilation of the experiences of only a fortunate few of farmers who have been bought under the scope of the “Cross-border Transfer of Agricultural Technologies, Institutional & Market Development Project” funded by The European Union and implemented by Concern Universal (Bangladesh), RGVN (India), Dhaka Ahsania Mission (Bangladesh) and Helvetas Swiss Intercooperation (Bangladesh) for the period from January 2012 to December 2014. These stories compiled and presented here depicts the impact of the various initiatives taken up under the sponsorship of the project and reflect the achievements of only a handful of farmers, their groups, Local Service Providers who came forward as flag bearers of change, innovation and enterprising spirit. There is however plentiful of other such experiences and achievements which may be comparable or even better than those findings mentioned in this collection. It is the outcome of sincere endeavour to capture, document and publish project impacts in a lucid manner.Read more….